On Saturday December 1st at least 595 people were reported to have been arrested, and many wounded. 7. Jakarta,140 people surrounded and blocked in front of YLBHI office. Listed above are the numbers of detainees as of morning December 3rd. As details become available and reports confirmed, we expect these numbers to fluctuate. As evidenced in this BBC video the majority of Papuans, and all groups formally organized under the umbrella of the United Liberation Movement for West Papua, are committed to securing their freedom through peaceful resistance. 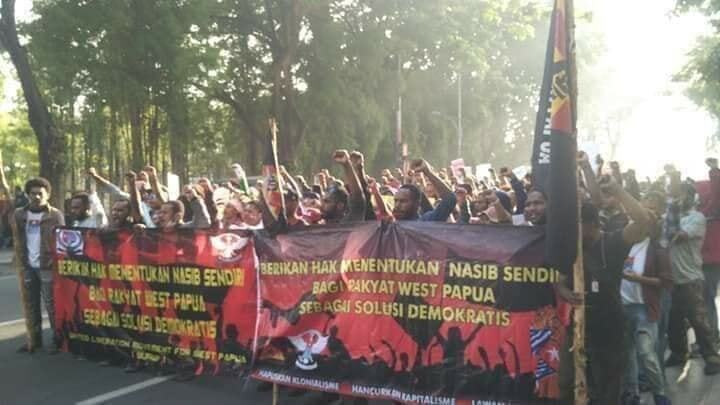 The BBC video from the rally in Surabaya clearly shows that in the face of counter protesters and heavily armed police, the Melanesian people remained passive. With aggression surrounding them they are seen here cooperating with police, staying in formation, and stoically singing their songs of freedom. Abide by universal human rights laws that protect freedom of speech and freedom of assembly. Improve access to West Papua by permitting foreign journalists and NGOs to investigate and work without restriction. 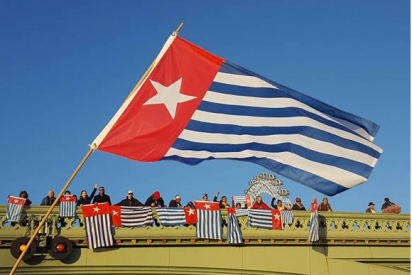 The United Liberation Movement for West Papua (ULMWP) has appealed to all international media covering West Papua to please contact Simeon Daby, Chairman of the ULMWP Action Committee +62 81245157935. English and Bahasa Indonesia interviews available. All the ways you can get involved and take action for West Papua in 2018!